Thanksgiving is coming up and I wanted to share this real easy felt pumpkin diy before it’s time to switch completely over to Christmas stuff. These little pumpkins are made with very few materials and can be added to napkin rings, headbands/hair clips/pins, gift tags, magnets, and whatever else you might think of. After I styled the above picture, I thought they might look pretty on a wreath as well. Or what about a garland? See? Endless possibilities. 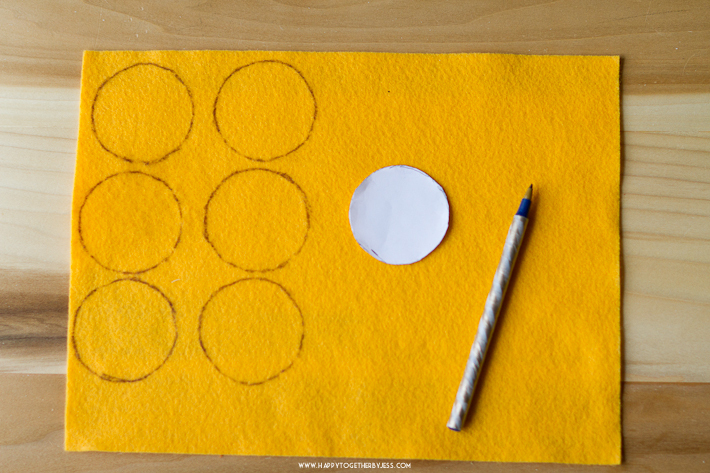 Trace six circles on your felt. Cut circles out. Make sure to cut inside of lines so they don’t show on the circles. Cut a little pumpkin stem out as well. Fold a circle in half and dab some glue in the middle fold. Hold in place for a few seconds until cooled down. Repeat on 4 more circles. There will be an unfolded one left. Take a half circle and put hot glue down the folded side. Lay another half circle on top, matching up on the fold. Repeat for the rest of the folded circles until it looks like above. Open up the two outermost sides and glue the last circle to the back. It will help the pumpkin be “open” and will give a nice flat surface to add onto other things. I added a pin on one and a hair clip on another to try out.